How is it already the last Friday in October? Time's flying, folks. This week's been full of iced coffee, baseball watch parties, and sweet celebrations with even sweeter friends. I haven't dressed up one time for work this week, thanks to the Royals and a faculty photo. Yesterday, I heard a kid in the hallway yell, "Mrs. Kleinmeyer looks like a teenager!" What he doesn't know is that I'm totally still a kid at heart. But I digress. Happy Friday, y'all. Here's hoping your weekend is full of non-professional dress, celebrations, and feeling youthful too! There's been lots to celebrate lately! Not only has it been a gorgeous and unseasonably warm fall, but our dear sweet friends had their first baby, we went to the wedding of two church friends, and we've been cheering on our Royals in the World Series. We've had watch parties with friends and YoungLife kiddos, played Royal Bingo, and worn the same shirts multiple times for superstitious reasons. We love Kansas City all of the time, but it's been even more fun to see everyone here rallying behind a team that's making us super proud (even if it takes almost six hours and fourteen innings to get the win). We've been a little sleepy and coffee dependent lately, but there's nothing quite like the excitement around here right now, especially with a 2-0 lead. Looking forward to another family wedding and somebody turning the big 2-5. 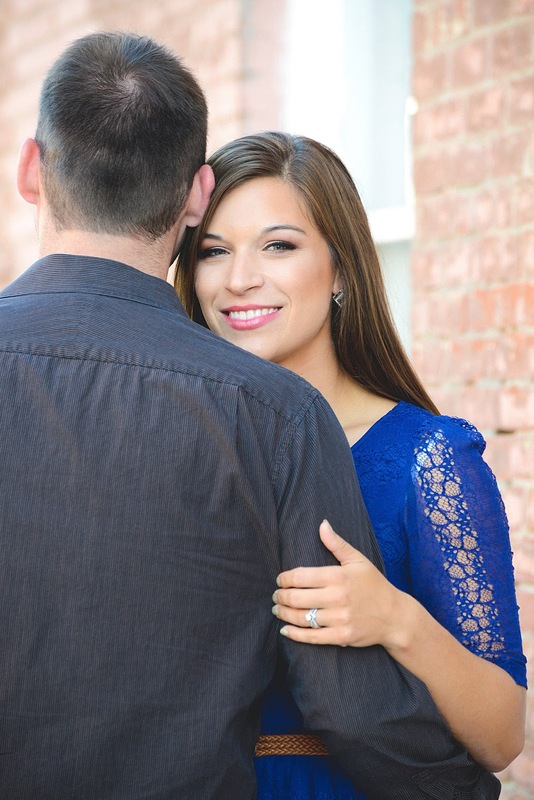 I am so excited and honored to announce that I've been accepted as one of the newest contributors to His Endless Love. This blog is a self-proclaimed "small ministry, filled with Jesus-seekers who write to inspire, encourage, and empower women to live, love, and lead". How cool is that? These goals are totally in line with my blog tagline: Love Fiercely, Learn Fearlessly, Live Fully. I shared a guest post on the site a month ago, and will now be writing a post for them once a month. It's made of some amazing and encouraging women (yay for community!) and I couldn't be more excited about the chance to share my heart and my words in hopes of ministering to others and sharing honest conversation. If you drive by our house on Saturday and all our lights are off, Aaron and I aren't being Halloween grinches, we're just busy making and handing out popcorn at our church's annual Trunk or Treat. (Also, sorry that our pumpkins have already rotted and or been eaten by squirrels. We tried.) 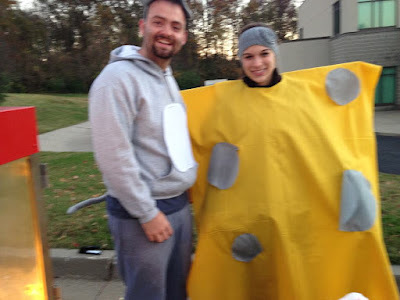 For the past four years of this fun little outreach, we've shown up in a couples costume and have had a blast sharing snacks with the community. If you're curious, or looking for last minute ideas, our previous costumes have been fairly creative: 1. Burger King and Queen. 2. Wolf and Red Riding Hood. 3. Mouse and Cheese. Yes, I seriously wore the outfit above, rod across my back and all. No shame: it was quite comfortable and warm. 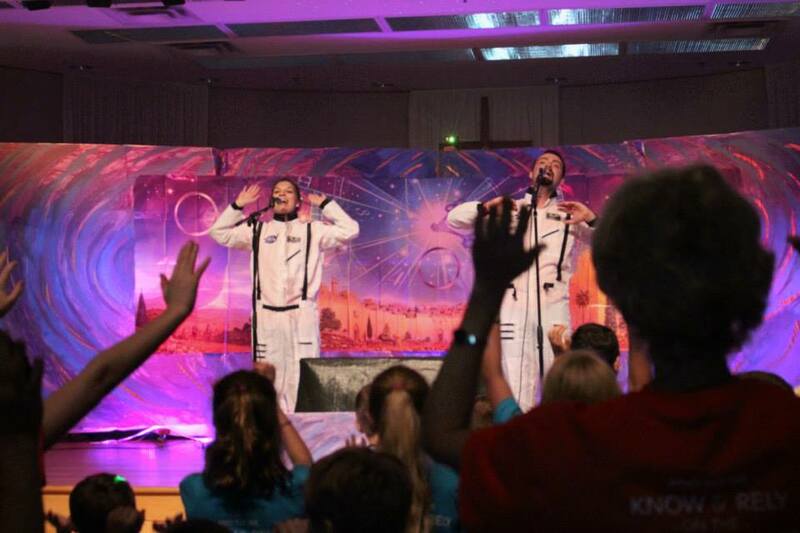 This year, we're showing up as Justin and Avery: the time travel tour guides I came up with who led music at Vacation Bible School this year. We're pretty excited to be making a comeback! And remember, we'll get you there just in time, avery time (wink wink). Last night I had the pleasure of getting together for a long overdue girls' night with three high school friends. It's such a joy to share gringo dip, laughter, memories, and all those inside jokes and stories that drive other people crazy when non-high school friends are around. Thankful for these sweet ladies, their husbands, their babies, and the way in which we can always pick right back up where we left off. Crazy to think that's it been almost NINE YEARS since we all walked the same halls together. (What?!). Excited to see all that is to come in the next nine, and to make these get-togethers into more regular occurrences. These aren't my high school friends. 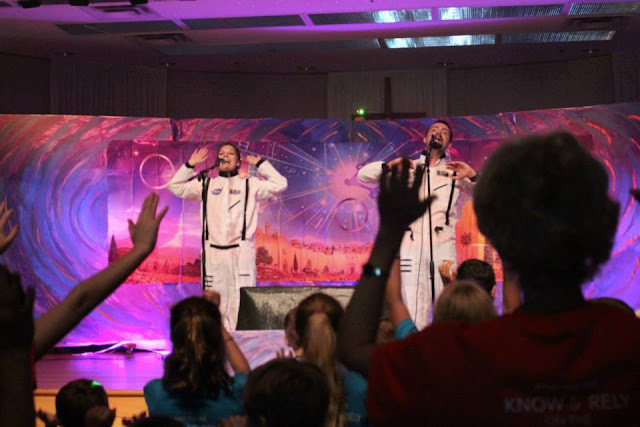 This is us celebrating our 2nd Anniversary with all our VBS friends. You caught me. 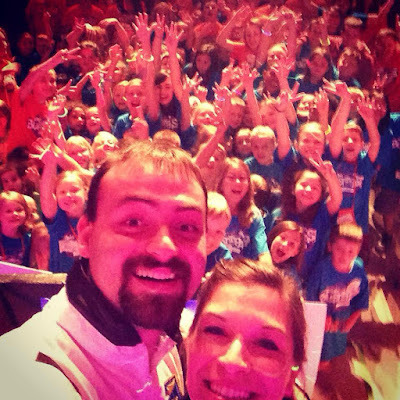 I know I've shared here and there about the ministry of YoungLife and my involvement with it. This week marks the two year anniversary since we "re-started" YoungLife club in the area, and it has truly been such a joy to see it grow and flourish. I would've never dreamed that the club run by just my husband and me would become a party in an amazing basement space with twelve leaders in only two years. Not to mention the amazing kiddos that are seeing a vision and getting their friends involved. We have been absolutely blown away by the support of the community, and the parents are incredible. God is good, and I'm thankful that we get to be a part of His big picture for this area. What have you been up to this week? I hope you've made time for fall snuggles, a chick flick or two, and maybe some pumpkin carving. Hope you have a wonderful weekend! I'm linking up with A. Liz Adventures, Motivational Monday, Modest Mom Blog, Me, Coffee, and Jesus, What Joy is Mine, The Diary of a Real Housewife, Uniquely Unfolded, Grace and Love Blog, Grace and Truth, Running for Cupcakes, Momfessionals, Life in Leggings, Tell it to Me Tuesday, Bliss and Faith, Sweet Little Ones, The Painted Teacup, Twinkly Tuesday, Women with Intention, and DIY Vintage Chic. HOOOOORAY!!! I'm so happy for you! You are going to bring so much to that contributor spot! Can't wait to see what it brings! Thanks Kayla!! I'm pretty excited! Congrats on the contributor position! Young Life is a great ministry and I know many leaders and kids who have loved it! Your costume is so funny by the way. 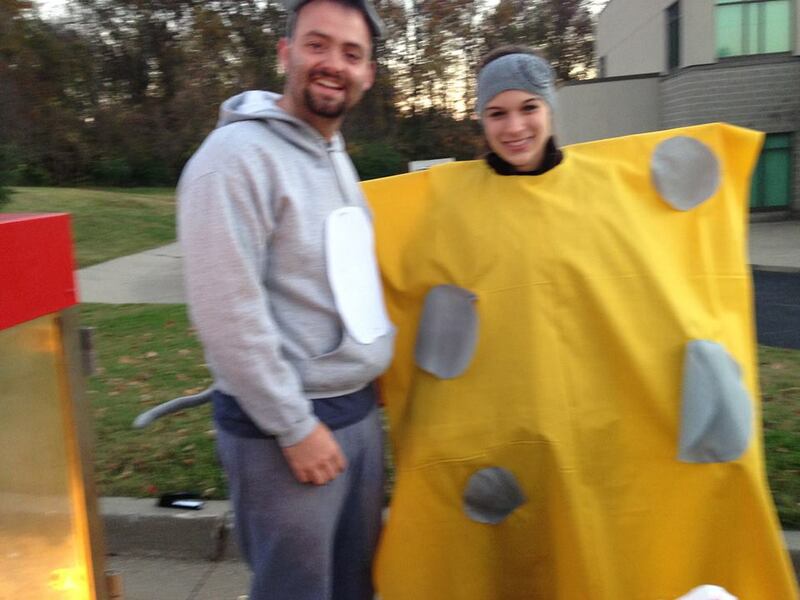 You could say that you're "the big cheese"
Thanks so much, Chelsea!! You are right, haha! Congrats! It's a blessing to find your blog! Well thanks, Regine! I'm thrilled you're here! Well thanks so much- you are so right! Hope you have a wonderful weekend and thanks for stopping by! 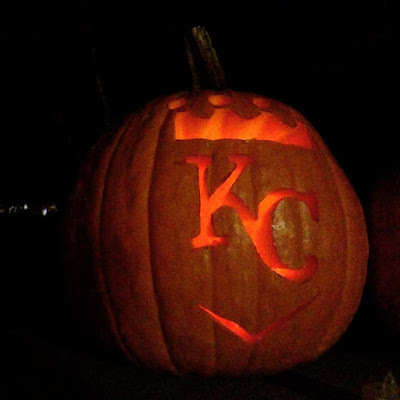 I've been cheering for your Royals, too! Those Halloween costumes make me giggle. I love how cute you two are with stuff like that! You rock it :) That's so fun about YL too! It's amazing what God has used you guys to do over these last few years. What a sweet thing to watch! Haha- they make me giggle too Lauren! Thanks so much, you're too kind :) Super fun for sure! Congrats on the "His Endless Love" contributor spot! That's so exciting!! Well thanks so much!! Gringo dip is amazing yummy queso dip that is the absolute best on the 54th Street nachos. They have the restaurant in Missouri, Kansas, and Texas. It's our favorite! I love HIs Endless Love! Congratulations! That's a great accomplishment! Congrats on being a new writer! You are going to do great things there! Thanks for linking up with us at Fav & Fails; I hope you have a fantastic weekend! so neat to see you guys investing so much in others from your lives! that's awesome about becoming a writer! Thank you, Charis! I am so thrilled. Thanks for stopping by! Ha, thanks Ashley! I love sets of three :) It's been really fun to share it with others. Thanks for reading! That is exciting news! Congrats on getting to contribute to an awesome blog full of wonderful bloggers! Also I agree high school friends are the best. My best friend and I got to see each other after 5 years and it was amazing. He and I picked up right where we left off in 9th grade! Thanks so much Ashley!! That's so fun that you have that sort of friendship! Thanks for stopping by.